This is the third in a sequence of three reports on Parody & Pastiche, commissioned to evaluate policy options in the implementation of the Hargreaves Review of Intellectual Property & Growth (2011). Study I presents new empirical data about music video parodies on the online platform YouTube; Study II offers a comparative legal review of the law of parody in seven jurisdictions; Study III provides a summary of the findings of Studies I & II, and analyses their relevance for copyright policy. Parody is a significant consumer activity: On average, there are 24 user-generated parodies available for each original video of a charting single. 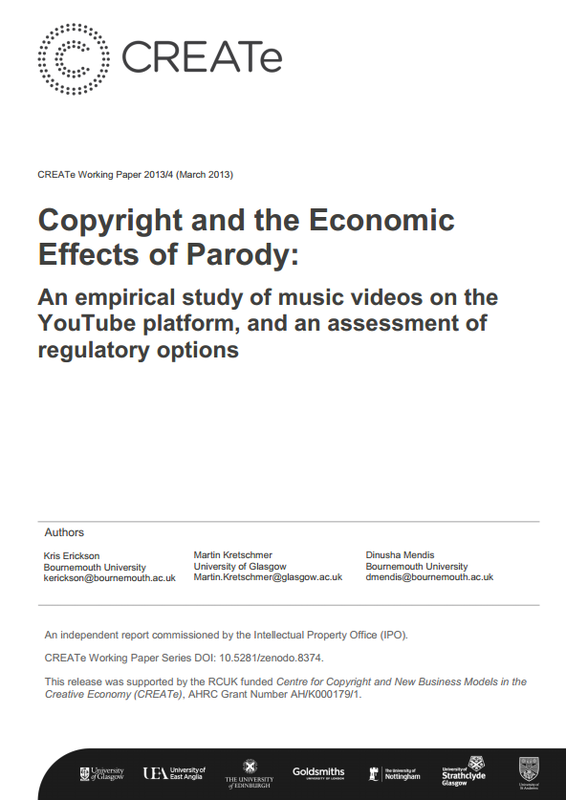 There is no evidence for economic damage to rights holders through substitution: The presence of parody content is correlated with, and predicts larger audiences for original music videos. The potential for reputational harm in the observed sample is limited: Only 1.5% of all parodies sampled took a directly negative stance, discouraging viewers from commercially supporting the original. Observed creative contributions were considerable: In 78% of all cases, the parodist appeared on camera (also diminishing the possibility of confusion). There exists a small but growing market for skilled user-generated parody: Parodists who exhibit higher production values in their works attract larger audiences, which can be monetized via revenue share with YouTube. Secondly, we present a distilled discussion of the legal treatment of parodies in seven jurisdictions that have implemented a copyright exception for parody (Australia, Canada, France, Germany, Netherlands, UK, and USA). The underlying principles (including economic and constitutional) governing divergent legal approaches are identified, and a list of policy options is presented. Thirdly, we provide a synthesis of the legal analysis and the empirical data. Each of the policy options identified in Study II is examined for its likely impact on the empirical sample gathered in Study I.
Download Copyright and the Economic Effects of Parody.